"Action Packed adventure, filled with daemons and hero's." Paul is a seemingly ordinary guy, at least that's what he thought until his abduction. Upon being abducted he learns a great deal about himself, his abilities, and the war that he finds himself in the middle of. He is not a warrior and never had formal military training but his new found ability to maneuver through time makes him a huge asset. Paul always seems to be racing against time as he copes with a new life and constant adversity throughout this fast-paced adventure riddle story. The Unseen War has not been tagged yet. Help others find The Unseen War by tagging it! 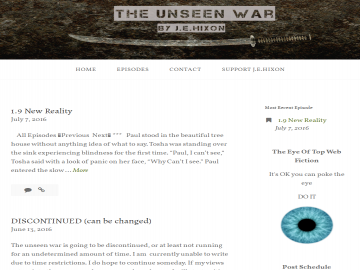 The Unseen War has not been reviewed yet. The Unseen War has not been recommended yet.